I guess when you’re already feeling guilty about marrying your buddy’s ex-wife you’re just a hop, skip, and a jump away from feeling guilty about your social status, too. This work was one painted later on in Millais’s career, after all the drama with Effie and John Ruskin had gone down and Millais and Effie were happily married, living in Perth, Scotland. Millais’ wedded bliss was not to last, though, as he began to notice something about his home town. During the 1800s, there was a major shift in Scotland’s social structure. Education became more common in communities of lower class citizens, leading to an unexpected and unanticipated spike in the middle-class population. There weren’t enough middle-class jobs available, so the majority of the Scottish population went abroad to look for greener pastures. The lack of work also meant that the poor often couldn’t afford rent and were evicted from their homes. That is, in part, what inspired this piece for Millais. The other part being the poem from “As You Like It” by William Shakespeare. 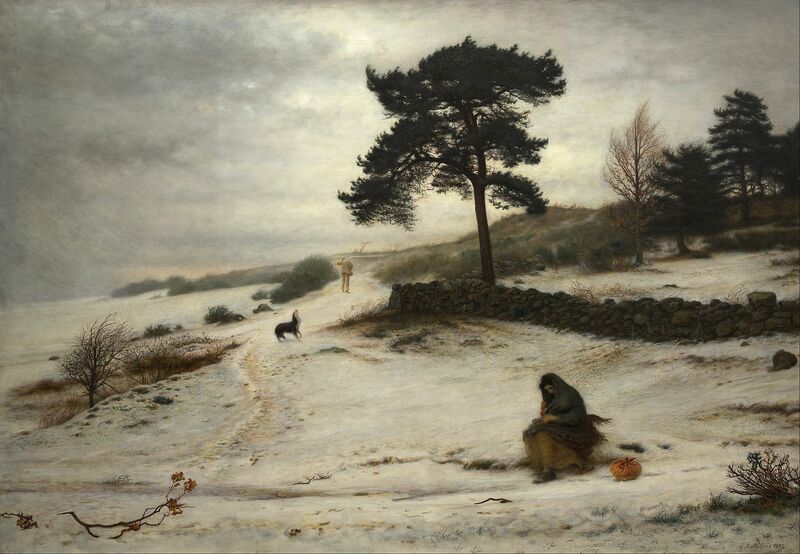 Scenes like the one Millais painted here were fairly common throughout Scotland at this time, as families were torn apart due to homelessness, desperation, and hunger. Millais said, though, that this was not a sight unique to Scotland, that all of humanity ultimately shared the same struggle to stay together in the face of industrialization. Even dogs in the age of industry are affected, look how torn the puppy is between its two owners! I guess once a pre-Raphaelite, always a pre-Raphaelite. There’s just no shaking those anti-industrialization and anti-modernization feelings. Gallery, Auckland Art. YouTube. April 03, 2012. Accessed October 31, 2017. https://www.youtube.com/watch?v=DYrkfcknG2I. "Sir John Everett Millais." The Tate Museum. Accessed October 31, 2017. http://www.tate.org.uk/art/artists/sir-john-everett-millais-bt-379. William Shakespeare. "As You Like It." 2.7.182-201. https://www.folgerdigitaltexts.org/html/AYL.html#line-2.7.0.